Magnesium oil on my skin some 2 times a day under my arms and on my feet at my right lower back and on my left shoulder has resulted in eliminating body odor… hooray! But it has also resulted in making me immensely super sleepy. So sleepy that I’m extending my sleep past 7am into 8am and even feel lazy by 9am. In short I’m losing a lot of work that I would rather do. Maybe I really need the healing sleep or maybe it is a bad side effect. It has finally happened, a very nicely produced short documentary, USA sensationalist mass media style documentary featuring Derek, also known as member “Sabertooth” in www.rawpaleodietforum.com. Derek has been talking about first some possible dangers about shooting a film like this in his country where it seems anyone who is different gets phoned in to their “authorities” and children are in danger of being taken away because a parent practices EXTREMELY HEALTHY diets that will make his entire family TOO HEALTHY for the neighbours to stand. I am beginning a magnesium oil supplementation via transdermal means… via skin absorption. It seems me and my family have a magnesium deficiency. In my readings some pundits say majority of the urban population is magnesium deficient. And it is not just because of the food. In fact, magnesium via food can only do so much. It has more to do with the environment. Just like breathing for our lungs, there is no substitute for getting fresh air. Driving out to the mountains or the the ocean, or to the golf course. 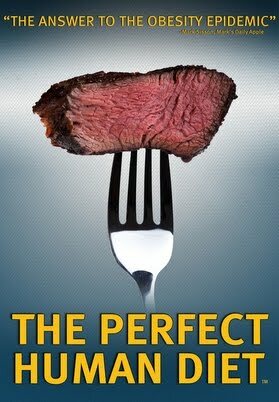 I watched the Perfect Human Diet a few days ago and I was impressed at CJ Hunt’s collection of experts. I loved how Cordain used the football field to show the 2 million year old scale of time of “human” evolution. And the closing saying that if Paleo Diet was a FAD, then Paleo Diet is a 2 million year old fad at the end. Nice observation, yes, the host did not touch on the raw / cooked thing. He just said Paleo Diet… was the host a raw paleo dieter? Maybe the host is a covert member in raw paleo diet forum? Although in his radio interview at Oneradionetwork.com, CJ Hunt says that he merely went on his investigative journalism and has no direct opinion for the viewer of his film. It is what it is, that evolutionary investigation into diet is a big thing. I would like to see in the future all this Saturnian cosmology horned into this discussion. How long was the earth recently under Saturn’s plasma sheath? 1,000 years… or more? Was earth always a part of Saturn’s planetary system? Did humans and all life on earth evolve or were born in a Saturnian planetary system? Or were we mostly under the Sun, then temporarily under Saturn, then given back to the Sun? What were the conditions on earth like before Saturn’s plasma sheath? How have things changed during the turbulent solar system times to the calming down times after 685 bc? In the uncovering of history in the Saturnian cosmology website, the author Jno Cook talks of a civilization in the Mediterranean area of 200 million people… then some big flood came and only 5 million survived, the civilization was lost and everything had to reset. This was several thousand BCE? There are now underwater civilization structures uncovered pre 9k bc and others like in Russia 25k BCE and that sunken empire continent off Sri Lanka and its language is said to be 50k years old. Which gets me to think that this current run up to this current civilization calendar which is at most 2500 years old in the making via Gregorian or 4000 years old in the making via Chinese lunar calendar… this current civilization is just the latest run up. Perhaps human civilization has been rebooted many times prior. If anatomically same as we humans today humans appeared 200k years ago, bet you they didn’t sit around goofing off to wait and progress for 200k years long… that would mean they were stupid. Think about it. If the solar system configuration was the same for the past 200k years, then we should have a calendar that is at the minimum 100k years old! But our solar calendar is only 2000+ years old… too young! Very recent solar system changes! Even the moon is young! Only 4k years of lunar calendar? It’s like the movie the Matrix. We don’t know yet how many times human civilization has rebooted. First off, we need Saturnian cosmology and the electric universe to WAKE UP the rest of the sciences, archaeology and history and everyone else so they can get off their fat lazy butts thinking they already know everything. Time for more scientific progress! Below is the product of my research regarding the ancient Greek Olympics spanning probably a thousand or more years from the beginning 776 BCE to the 7th century AD. What I will strive for is to be able to construct a menu that was suitable for ancient Olympians… not the poverty fare of the Greek peasants during that time.